Bank of Baroda Recruitment 2019: Bank of Baroda will be released recruitment notification to fill up various vacancies for the post of Specialist Officer. It’s a golden opportunity for all the job seekers who are currently looking for Bank Jobs. 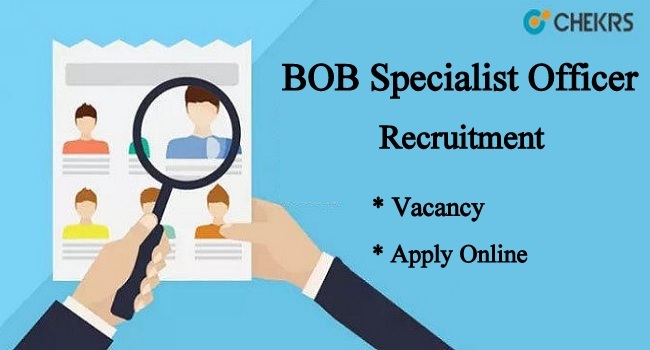 Therefore interested and eligible candidates can now apply for BOB Specialist Officer Recruitment 2019 through its online application form before the last date. In regards to other details such as Age Limit, Eligibility, Selection process, last date go through the article below and get complete details. Latest Update: Bank of Baroda will soon release the Specialist Officer Recruitment 2019 Notification to fill the various vacancies. Interested & eligible candidates can fill the application form from here. Bank of Baroda will be released recruitment notification to fill up various vacancies for the post of Specialist Officer. (बैंक ऑफ बड़ौदा विशेषज्ञ अधिकारी भर्ती): Bank of Baroda is an Indian state-owned International Banking and Financial services company with its headquarters located in Vadodara, Gujarat, India. It is the second largest bank in India, next to State Bank Of India. It has its corporate office in Mumbai. Every year Bank of Baroda (BOB) releases numerous job opportunities and provides employment to individuals who are looking for Government Jobs. The BOB will be released Bank of Baroda SO Recruitment 2019 to fill various vacancies for the post of SO in grade scale I to V. Therefore all the young and energetic candidates who are willing to take a successful banking career can now apply for Bank of Baroda SO Vacancy 2019 soon through its online application form. Candidates applying for BOB Vacancy must possess Graduation Degree or 4 years Engineering/ Technology Degree or Post-Graduate Degree with minimum qualifying marks from a recognized University. The Participated candidates minim age should be 21 years and maximum age should be 50 years. The candidates can vary the age limit according to posts details. The age relaxation for the reserved category will be based on the BOB Norms. Candidates applying for Bank of Baroda PO Vacancies have to apply online through its online application form and make payment of application fee. You can check the details below. Navigate to Announcements and Select the Desired post. Save and take print out of online application for future use. Bank of Baroda announces the recruitment for the post of Specialist Officer (SO). Therefore to receive more updates on Bank of Baroda Recruitment 2019 keep visiting our site www.jobs.chekrs.com. For any kind of query or review place your valuable comments in the commenting section below and our team will revert you in a short while.